Soreide Law Group has been recognized for excellent customer service and satisfaction. We have successfully represented hundreds of Applicants before the Florida Board of Bar Examiners in investigative and formal hearings. Are you the target of a Florida Bar Investigative Hearing? Are you being investigated by the Florida Bar? Are they calling into question your character and fitness? Are you now facing an investigative hearing before the Florida Board of Bar examiners? If so we can help. 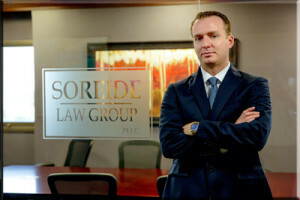 Call the Soreide Law Group today for a free consultation 888-760-6552. Low rates and flexible payment plans for law students. Also ask about our $99 Bar Application review. Soreide Law Group has successfully represented over 100+ bar applicants. Florida has one of the most stringent and thorough character and fitness examinations. For a one time $99 fee we will review your application before filing. Why wait months for the Board to make requests when we can review your application and help you correct any deficiencies? This evaluation could save potentially thousands in legal fees and avoid a hearing before the Florida Board of Bar Examiners. Applicants are afforded the right to file an answer to the specifications and to a formal hearing on the specifications. At the formal hearing, the applicant has the right to representation by counsel, to introduce testimony of witnesses and exhibits in his or her behalf, to compel the appearance of witnesses by subpoena, and to conduct cross examination of witnesses. Fla. Bar Admiss. R. 3-23 , 3-23.1 & 3-23.2. Absent consent of the applicant, the Board members who participate in the informal, investigatory hearing do not participate in the formal hearing. Fla. Bar Admiss. R. 3-23.2. Following a formal hearing, the Board may make one of the following recommendations to the Florida Supreme Court: that the applicant has established his qualifications as to character and fitness, that the applicant be “conditionally admitted” on certain conditions, or that the applicant has not established his qualifications as to character and fitness. Fla. Bar Admiss. R. 3-23.6. Where the Board recommends an applicant for admission, the Bar Admission Rules provide that “[i]f the Court is satisfied as to the qualifications of the applicant so recommended, an order of admissions shall be made and entered …” Fla. Bar Admiss. R. 5-11. While achieving the best possible outcome, Lars represented me in an extremely professional manner with no issues in communication regarding any steps of the entire process. I currently recommend him to my closest friends and colleagues without hesitation. Mr. Soreide represented me and Everything went great. I highly recommend hiring Mr. Soreide. Preparation is key and he was super prepared for the hearing. Thank You. Lars got the job done! Lars represented me in my matter with the up-most class and precise attention to details. He listened and understood my case and worked diligently to ensure that I ended up with the best outcome possible. In fact, I ended up with a result surpassing my expectations. I highly recommend Lars Soreide. My matter is confidential, but I wanted to say that he made the process I had to go through much easier. He know a lot about the areas of law he works in. I had an extremely stressful hearing pending admission to the Florida Bar. Lars told me exactly what to do to prepare, and gave excellent advice about how to handle the hearing. It went very smoothly thanks to him, and I would strongly recommend him to anyone facing issues with admission to the Florida Bar. Lars is an extremely competent and knowledgeable attorney who offers a very personable service. He cares greatly about his clients and I would greatly recommend the services of his firm. Lars is reliable, honest and knowledgeable. I would absolutely recommend him as an attorney in his specialized field. When the Board does not recommend that the applicant has established his qualifications as to character and fitness, the Board must issue “written” findings of fact and conclusions of law; and such findings must be supported by “competent, substantial evidence in the formal hearing record.” Fla. Bar Admiss. R. 3-23.7. The applicant has the right to petition the Supreme Court of Florida for review of any such adverse recommendation. Fla. Bar Admiss. R. 3-40.1. In cases like that of the Plaintiff–involving an application for admission (as distinguished from an application for readmission)–the Board’s findings, conclusions and recommendation becomes “final if not appealed” to the Florida Supreme Additionally, any applicant whose character and fitness investigation exceeds nine months from the applicant’s submission of a completed bar application may petition the Supreme Court for an order directing the Board to conclude its investigation. Fla. Bar Admiss. R. 3-40.2. Court. Fla. Bar Admiss. R. 3-23.7. A bar applicant who seeks Supreme Court review of the Florida Board of Bar Examiners character and fitness recommendation may raise federal constitutional and federal statutory claims. See Dale v. Moore, 121 F.3d 624, 627 (11th Cir. 1997) (Florida bar applicant had opportunity to raise ADA argument in applicant’s answer to specifications and in applicant’s petition to Florida Supreme Court for review of Board’s determination regarding applicant’s character and fitness); Florida Board of Bar Examiners re: Applicant, 443 So.2d 71, 76 (Fla. 1984) (considering federal constitutional claims of bar admission applicant, on petition to Florida Supreme Court). DISCLAIMER: Some of the information you are reading came from past information disseminated from the Florida Board of Bar Examiners through their website http://www.floridabarexam.org. The Board of Bar Examiners regularly updates their information and nothing written on this website should be construed as legal advice. For the most complete and up to date information it is important that you visit the Board’s website.